NASA scientists are releasing new global maps of Earth at night, providing the clearest yet composite view of the patterns of human settlement across our planet. 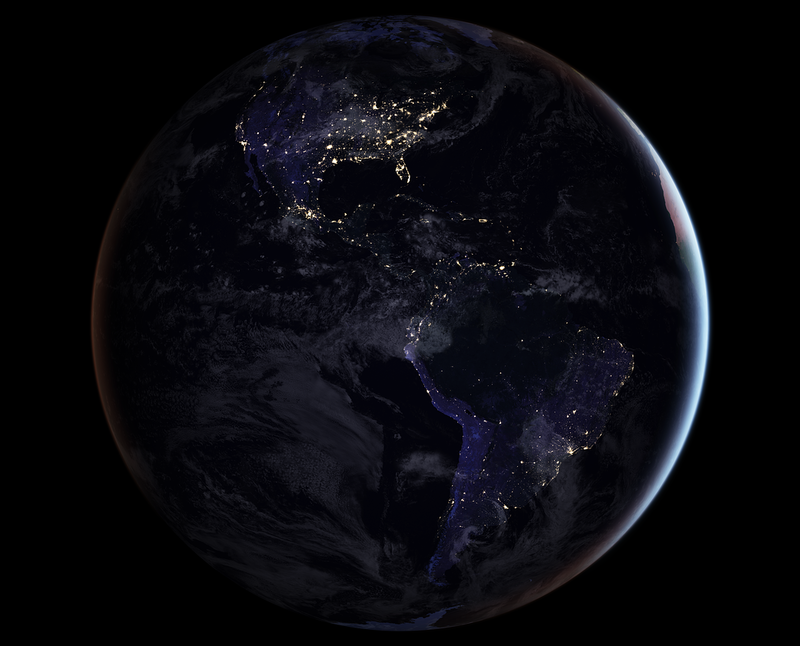 This composite image, one of three new full-hemisphere views, provides a view of the Americas at night. The clouds and sun glint — added here for aesthetic effect — are derived from MODIS instrument land surface and cloud cover products. In the years since the 2011 launch of the NASA-NOAA Suomi National Polar-orbiting Partnership (NPP) satellite, a research team led by Earth scientist Miguel Román of NASA’s Goddard Space Flight Center has been analyzing night lights data and developing new software and algorithms to make night lights imagery clearer, more accurate and readily available. They are now on the verge of providing daily, high-definition views of Earth at night, and are targeting the release of such data to the science community later this year. Today they are releasing a new global composite map of night lights as observed in 2016, as well as a revised version of the 2012 map. The NASA group has examined the different ways that light is radiated, scattered and reflected by land, atmospheric and ocean surfaces. The principal challenge in nighttime satellite imaging is accounting for the phases of the moon, which constantly varies the amount of light shining on Earth, though in predictable ways. Likewise, seasonal vegetation, clouds, aerosols, snow and ice cover, and even faint atmospheric emissions (such as airglow and auroras) change the way light is observed in different parts of the world.